When I was at Bennington College in the mid-70’s, on many weekends I would drive up to Randolph Center, a 2.5 hour drive, to stay with a friend who raised Morgan horses. I became very good at navigating back roads to get there, as it was boring always going the “speedy” way, Rt. 7 to I 89. On one such trip I went through Peru, onto Hapgood Pond Road, which, as it transected a long and broad high alpine meadow (Utley Flats) flanked by the mountains, came to a glorious end (or beginning) at Landgrove Road. There, the intersection was crowned with a classical white wood church and town hall, and I was sure I’d never seen any place in the Vermont countryside, or any countryside, nearly as beautiful. But it would be a very long time before I drove this road again. Twenty-five years later, looking for a place where I could spend part of the summer showing at the VT Summer Festival in East Dorset while my three boys went to camp at Keewaydin, on Lake Dunmore, I began searching for a vacation home. 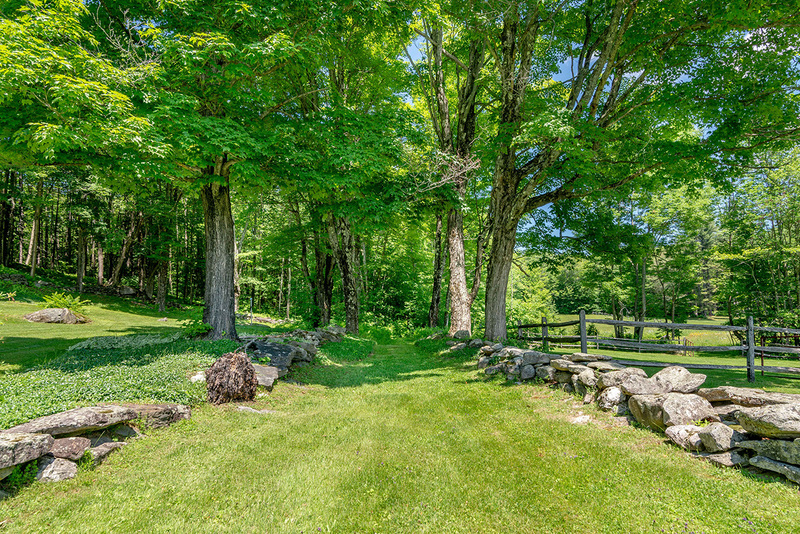 Directives to realtor: within 15 miles of Manchester, ski mountains, the horse show, on dirt road, room for horses, bordering forest, original, authentic, pure. She drove me around, showing me houses that were lovely, but were modern take-offs of antique homes, or antique homes that seemed over-renovated, over-decorated. Finally, we drove through Peru, and as we approached the junction in the distance where Hapgood Pond and Landgrove Roads meet, my head tingled as I experienced a simultaneous thrill of déjà-vu and serendipity. Driving down Landgrove Road toward the farmhouse, my anticipation grew: I hadn’t placed the lovely house in the listing on the road I’d once gone down many, many years before and had loved. Coming around the last bend in the road through the tunnel of trees, the house revealed itself – as a beautifully-sited surprise opening onto an enchanting, sun-drenched vista of meadows and Markham Mountain. Though I like an open concept kitchen/dining room, in this house the dining room becomes its own, atmospheric world that ensures conviviality. Sitting and eating together with friends and family in this room has always been a joy. Maple Allee was a no-brainer. 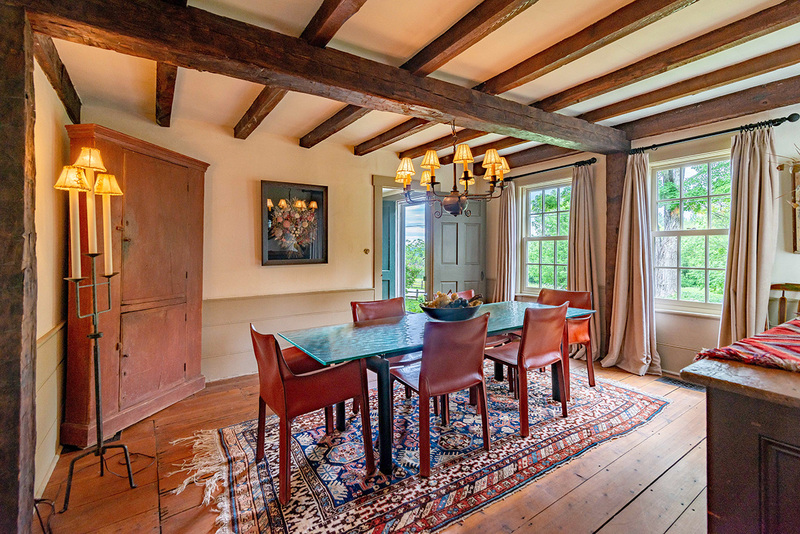 The people who owned it before had left things alone, the bones, the beams, the plaster walls, the pine floors. The place needed work, but my husband was an architect and we had fallen in love with the place. The house seemed pleased to have our family within it as we set to work reviving and restoring it. And happily, not much has changed. To me, the Landgrove Road is still as magical as the one paved with yellow bricks. The old path for taking the cows to pasture today connects into a network of trails through the Green Mountain National Forest. Editor’s note: Click here to learn more about Maple Allee.